In-n-Out ain’t got nothing on me! 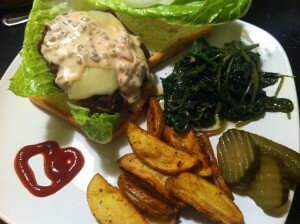 What you see here is a grass fed, organic raw cheddar burger with organic homemade “secret” sauce, oven baked organic steak fries, & fresh from my garden sauteed balsamic kale and spinach. Served with a mixed organic pickle garnish and for the “bun” I’ve offered gluten free Udi bread (not nutritional at all but has a white bread feel to it) and organic romaine lettuce, hubby likes the bread I just use the lettuce as a wrap. Serve this dish with copious amounts of red wine. Cheers! All ingredients should be sourced as raw and as organic and sustainable as possible. Mix everything up well with hands and form 4 patties, place in the refrigerator for about 1/2 hour. Grill to med/rare- med and add sliced cheddar or your favorite cheese. Coat the potatoes with the oil and then the seasoning, bake in the oven at 425 degrees on natural parchment paper for about 40-45 minutes or until cooked through. Heat olive oil in a pan at medium heat, add chopped garlic and cook until soft add the kale and or spinach and saute a bit longer. Now add you bone broth/chicken stock and cook until tender but still green. Drain any remaining broth and add balsamic. Salt and pepper. Serve immediately.